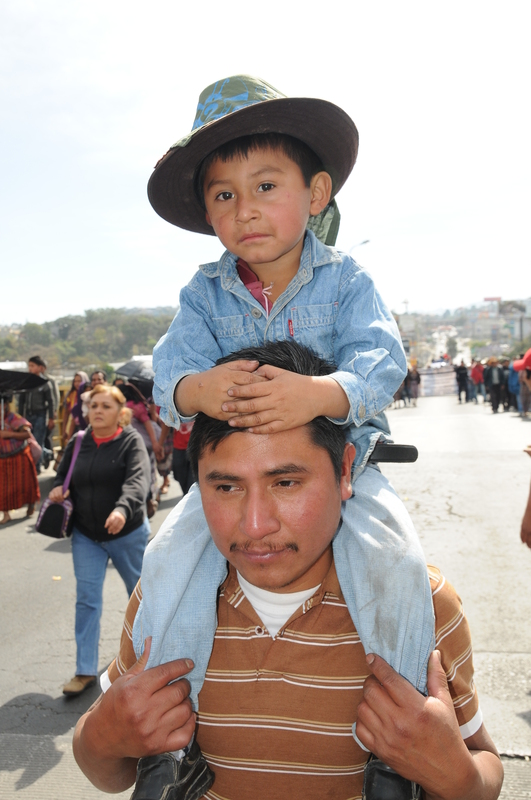 The timing of the march was chosen to coincide with the one year anniversary of the eviction of over 800 indigenous Q’echi’ families in the Polochic Valley. 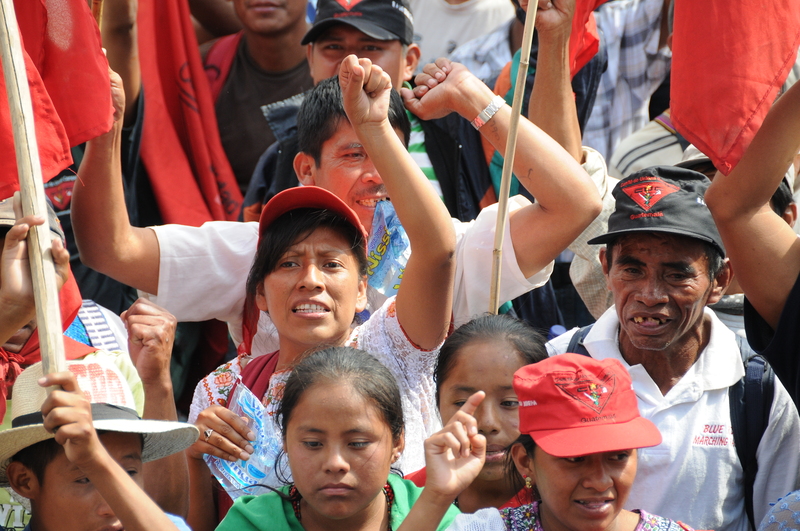 Members of the communities have suffered malnutrition and violent attacks even after the Inter-American Commission on Human Rights requested in June of last year that the Government of Guatemala institute precautionary measures to prevent a humanitarian disaster. 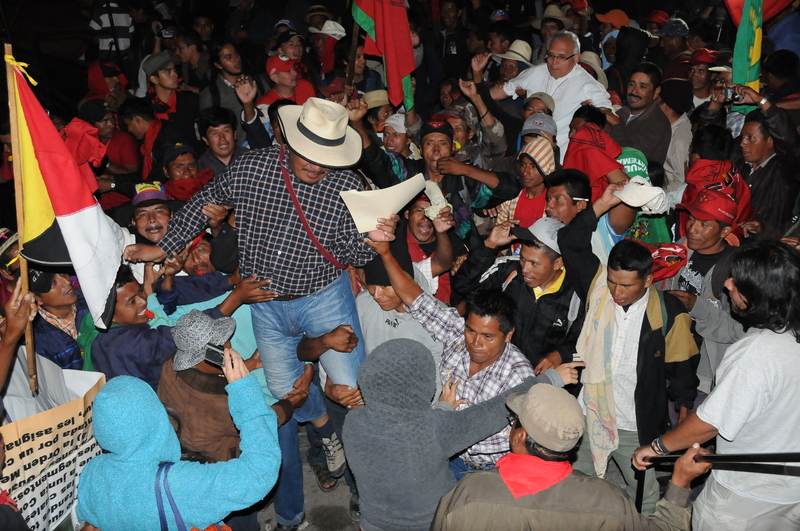 As the protesters stood before the Guatemalan Congress, Daniel Pascual, Director of the Committee for Peasant Unity, read a letter signed by over 2,200 members of the international community urging President Pérez Molina to protect the communities of the Polochic Valley and provide them with land. Over the past few months, the Latin America Working Group had gathered the signatures. 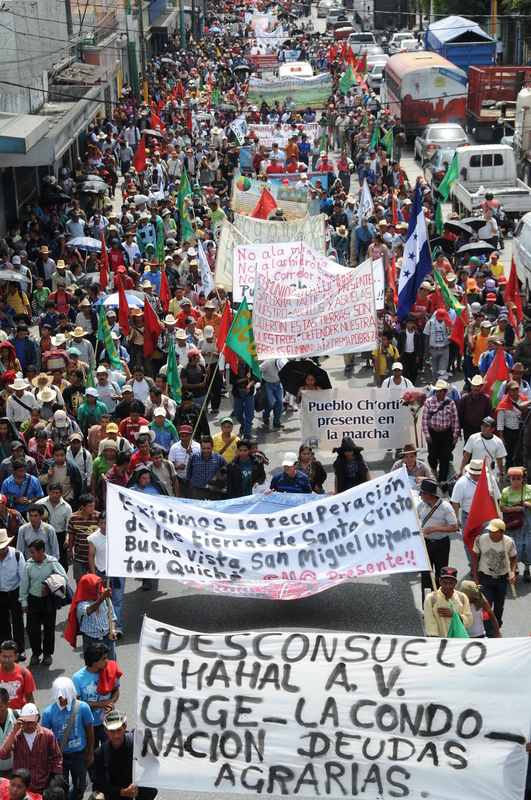 Then on Tuesday, the Guatemala Human Rights Commission/USA participated in the march and delivered the letter. The exhausted marchers and their supporters stood in the city’s central plaza until early Wednesday morning as leaders of the groups met with President Pérez Molina. Participants observed with alarm that soldiers with machine guns trained on the crowd were stationed on top of nearby buildings. Tensions further rose as nearly 100 police arrived and took up positions surrounding the park. While obviously intended as an act of control and intimidation against the peaceful gathering, no further steps were taken by the security forces. At 2:30am on Wednesday morning, the leaders finally emerged from the meeting and were greeted with wild applause, whistles and cheers. The exuberant crowd lifted Daniel Pascual onto their shoulders and carried him to the stage, where he announced an eight-point agreement between the peasant movements and the government. The removal of controversial military bases in areas marked by high social conflict. 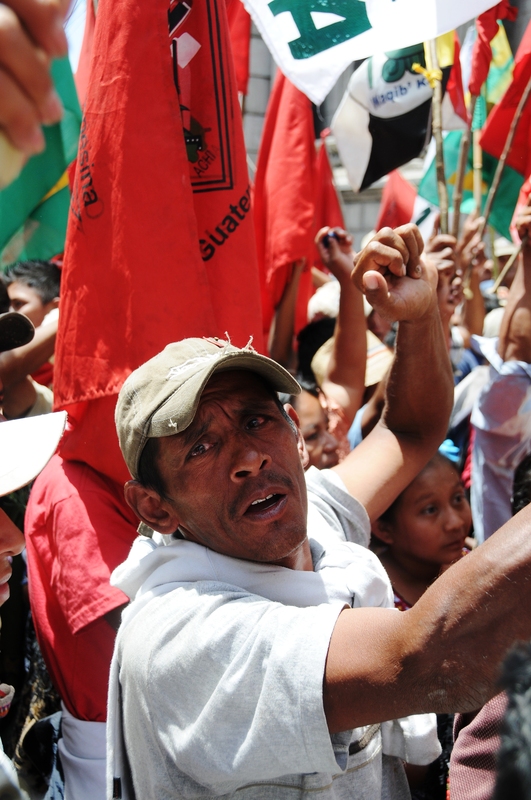 Although the peasant farmers enthusiastically received the wide-ranging agreement, they were all too aware of the tremendous gap that often exists between a signed accord and its actual implementation. The mood was one of guarded optimism. The event ended with the announcement of a follow-up meeting with the government on April 19 to evaluate its compliance with the signed accords. This entry was posted in News and tagged politics by ghrcusa. Bookmark the permalink.